Baking Fail: Macarons | I Wanna Bake! I started off by buying Thomas Keller’s Bouchon Bakery, a fancy cookbook that the internet assured me was a good authority on the subject. The recipe required a whole lot of fiddling and some very precise measurements, so it sounded about right. I also choked down any sense of thriftiness and spent $13 on a pound of almond flour, because darn it, I was going to do this right. [Note: I’ve since learned that you can buy almond meal at Trader Joe’s for about half the price.] I whipped out my trusty kitchen scale, separated a bunch of eggs, and got to work. Sadly, some time and many dirty dishes later, I could see the product of my hard work cracking and deflating away in the oven. I will admit that, while the plan was to follow the recipe exactly, I didn’t end up quite doing that. First, I have a pathological aversion to sifting. I think it takes too long and seems unnecessary unless there are chunks of stuff in your dry ingredients that you don’t want to be there. 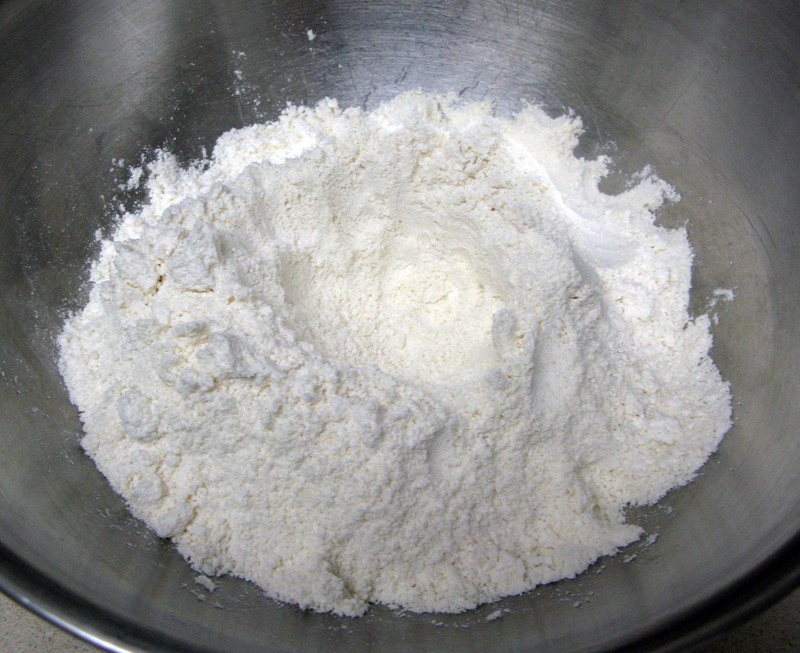 My (obscenely expensive) almond flour was quite finely ground, so rather than sifting the almond flour and the powdered sugar like I was supposed to, I just whisked it until it looked completely smooth and a little airy. Additionally, the recipe calls for a vanilla bean, but dude, those things are expensive, and none of my usual grocery stores carry them. I knew that introducing additional liquid into the batter was a recipe for disaster, but I decided to add a teaspoon of my homemade vanilla extract anyway. As if that wasn’t enough, I added a little purple gel icing color to the mix too. I’m including some slideshows of the step-by-step photos I took to give you some idea of how the process went. First, I started off with the almond meal mixture. So far, so good. 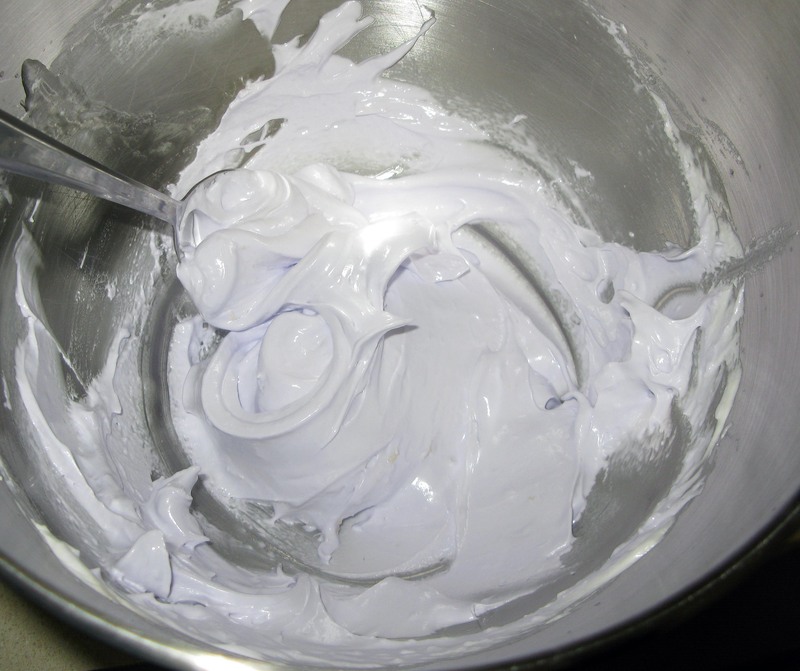 Next, I made the meringue. I didn’t start the syrup soon enough, so the egg whites probably got a bit over-mixed, but the meringue itself seemed to turn out well, even with the addition of the vanilla extract and food coloring, so things were still looking good. Next came the tricky part: incorporating the meringue into the almond mixture. This was the part that I was least sure of because I had never seen the batter made before. I had no idea what the consistency should really look like (I find the ribbon description a little unhelpful), so now I was winging things. Thankfully, now we were back in my wheelhouse. I transferred the batter to a piping bag and piped out circles of batter onto special silicone mats made specifically for making macarons. 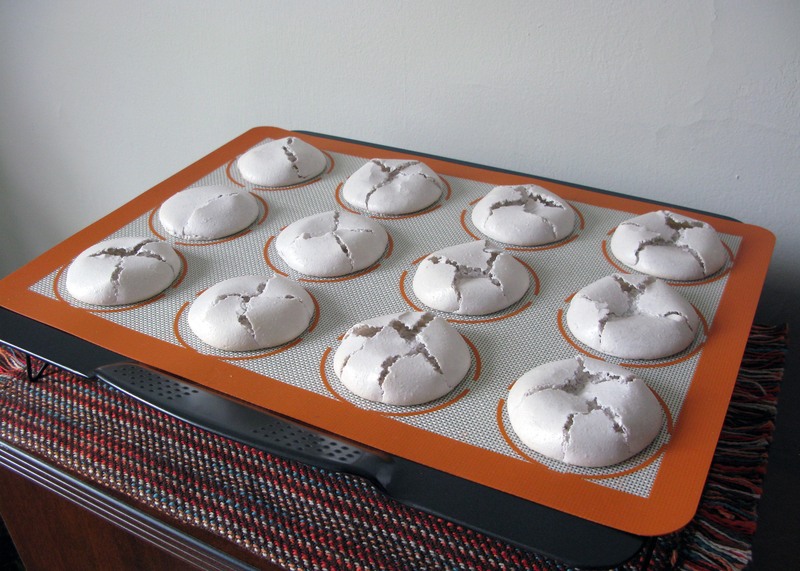 [The mats were a gift, but I did go out and buy these rimless cookie sheets at Michael’s to accommodate them. Those were a good purchase.] The batter spread a little, but that was expected. I had already preheated the oven per the recipe’s directions, so I put the first tray in and hoped for the best. Clearly, that is not what I got (the second tray followed suit). A botched bakeventure is always a letdown, but I didn’t get disheartened. At the end of the day, I did a pretty good job of following the recipe, for me at least. However, the results made it clear that I needed to do better. 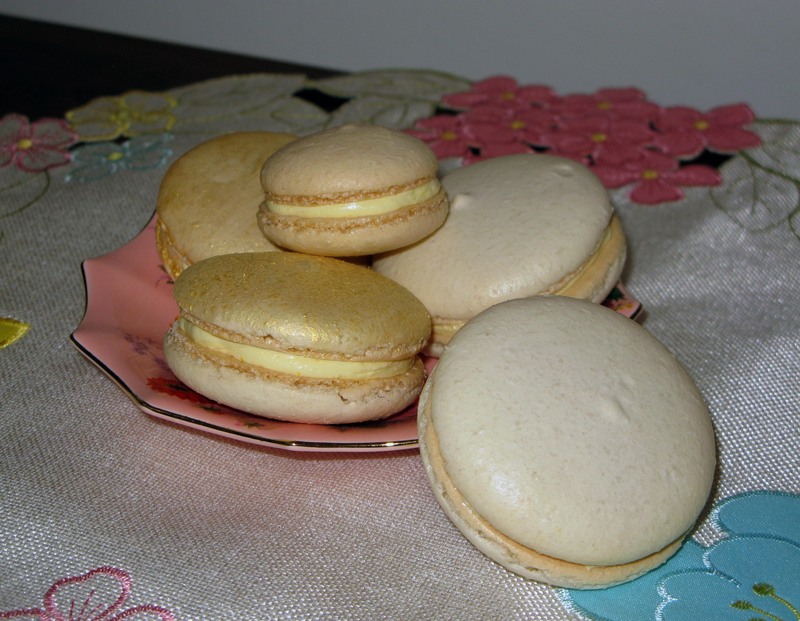 As any perfectionist might do, I consulted the internet and came across this post on macarons. I highly recommend reading it, as well as this one, preferably before you start. I’ve assembled my notes based on those posts and my own speculations in the hopes of helping you avoid this spectacular cracking. It has been raining or humid where I live everyday since the day I decided to try macarons. I kid you not. On the day I finally broke down and said I was trying it anyway, we were on the verge of thunderstorms all day long. This, combined with the added moisture in the batter, could have contributed to air bubbles that rose and popped during baking. I know my oven runs hot, but I really have no idea what temperature it actually is at when the knob says 300°F (the answer: anywhere between 325° and 350°). Meringue does best at lower temperatures, so it probably would have been better to turn it down about 25° and just watch the shells rather than go with the written temperature and hope that it wouldn’t ruin them (because it did). 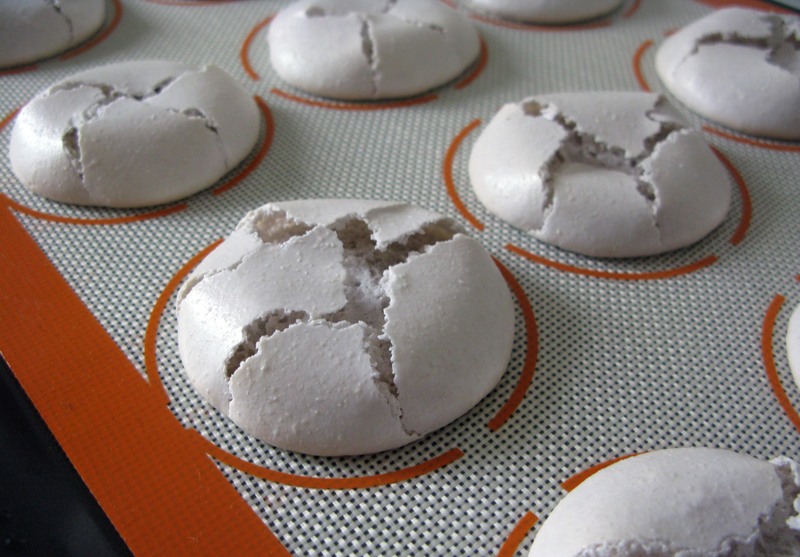 Every recipe I’ve read suggests rapping your cookie sheets on the counter to release air bubbles. This is usually something I have no problem doing, but for some reason, I really wimped out on it this time. I only did it once, and it was a pretty weak attempt. It’s very likely that the air bubbles trapped inside banded together beneath the surface, causing it to rise up like it was supposed to, but without the support of the batter inside. With nothing to hold it up, the skin cracked, and the inside deflated even more. Moral of the story: whack those cookie sheets on the counter like you’re trying to kill a roach (hard and repeatedly for good measure). Not to be defeated by a cookie, I tried again the next day armed with my newfound knowledge. I followed the recipe from the post I referenced above, and I ended up with significantly better results. They’re still not perfect, but it’s only the second run. So fear not, macarons are totally doable. They just might take a little practice and a lot of science (and actually following a recipe).